When a fighter suffers his first loss the mindset can go one of two ways; either a downward spiral that is hard to break, or viewing it as a learning experience to come back better from. 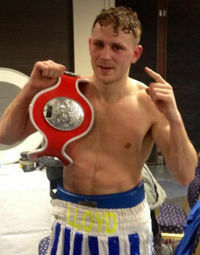 When Lloyd Ellett (17-1-0) suffered his first loss on October 2nd this year to Ryan Toms it ended an undefeated streak that went back to his pro debut in November 2011. However rather than becoming despondent over it, he sees it as an opportunity to make important changes and turn things around. "In terms of my career and moving forwards it's not that much of a setback. A loss isn't a big deal. I'm fighting in two weeks and looking to get back in the win column and I'll be back to where I was and I'm ready to step up again" Ellett tells me. "I'm not viewing it as a setback; it's made me train differently, look back at where I went wrong and really go through my preparation to look at what I'm doing and have been doing and make some changes. My style is different now, I'm making sure I'm not over training - I've been through everything." Still only 28 years old and with four years of professional experience, the man from Brighton also has a wealth of amateur fights under his belt through a long career in the unpaid ranks. "It was 64 fights I had in the end. I'd always wanted to be a pro really. When you start boxing that's what you look at, being a pro. It was always in my head to turn over. I had enough of the amateurs and got a bit bored of it, you wait all year for the ABAs and I boxed for England too but I was bored in the end so it was perfect to become a professional." Although originally from Brighton, it is now London where the likeable Southerner is now based. He has found his home at the Ibox gym in Bromley where he is surrounded by top talents, such as European welterweight champion Bradley Skeete, Southern Area welterweight champion Johnny Garton and the likes of Lewis Pettit and Sam Webb. With such a wealth of fighters around his own weight category there is no doubt that light welterweight Ellett is in a position where he can not only learn from others but fine tune his own ring skills in sparring his peers. With Ellett being able to reflect well upon the experience of his loss to Ryan Toms, is it a fight that in the future he would want to take again and avenge the sole defeat on his record? "I definitely want to avenge the loss at some point, I wouldn't want to leave it at that" says Ellett. On the back of that win Toms was able to move to an eliminator for the English light welterweight tile against On y Upton this last weekend at York Hall, a fight he lost on points after a strong effort in which he was the aggressor throughout. So does Ellett see himself as also being at that level still? "Most definitely. The Toms fight, I was winning and wasn't performing to my best at all then I got caught with a shot and paid the price. But I'm definitely still at that level" he insists, his confidence unwavering. Ellett will be looking to re-build the momentum he had prior to the October fight. In 2014 he picked up a Masters title, outpointing Gary Cooper for the belt. Cooper is someone Ellett cites as being a touch challenger, even if not on paper. “He didn't have the best record out of the guys I fought Gary Cooper, but he was very tough, strong and was a lot bigger than me. That was a ten rounder and I was pleased with my performance there, it was the first time I'd been ten rounds” he says. Ellett may be coming off of a loss in his career, but it is clear that he isn’t mentally scarred by the defeat. He sounds chirpy when talking about the past, present and future. The Fareem Khan fight represents an opportunity for him to get back on the horse and start to re-build the momentum that pushed him so close to an English title opportunity. 2015 may not have been his best year, but with a busy few months planned in front of him and a fight back in Brighton for early 2016, the next 12 months could provide a platform for a much happier boxing future. Lloyd wanted to thank his sponsors KSD Salt Services and The Shore Group who has provided key support through his career.